Where open source software is concerned, there is no shortage of critics and as a result there is also a fare amount of misconceptions. 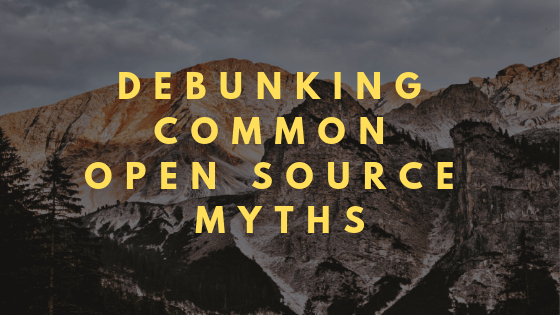 So in today’s blog, we’re going through the four most common myths surrounding open source software and setting the record straight! When it comes to software security, the licensing model has little to no impact. Instead, it could be argued that proprietary software leads to slower updates as only the vendor can make the necessary patches. Thanks to a diverse and knowledgeable community, open source projects also benefit from things like peer reviews contributed by supporters who care for the quality of the software as opposed to profiting financially from each improvement. Many of the world’s largest organizations aren’t just users of open source software, but, also base an enormous portion of their business on it. For example, Google and Facebook, rely on Linux for the running of their servers. As mentioned above, some of the biggest companies in the world make use of open source software for their day-to-day business. So naturally, these enterprises will remain concerned with the maintenance of the software that essentially runs the platforms on which their businesses are built. This is in addition to the community of supporters that work on, contribute to and test the open source software. Organizations also have the option and ability to hire an independent third party to provide support and consultation for their open source software. The majority of enterprise-class open source software runs on both proprietary operating systems and open source. Open source software utilizes the same open industry standards that permits interoperability as proprietary software. In some cases, open source software will even integrate with other systems better than proprietary systems. Despite having been in existence for decades, open source software is still susceptible to negative stigmatism. However, the majority of the information used to propel these concerns isn’t even accurate. Open source software is a credible, and even preferable option due to its many benefits such as the affordable pricing and extensive support that is available. As a proud contributor and user of OpenStack software since 2011, VEXXHOST has a solid history of experience in delivering open source cloud computing options to our clients and is well equipped to provide consultation services as well. To find out more information or start taking advantage of open source software, contact us today!